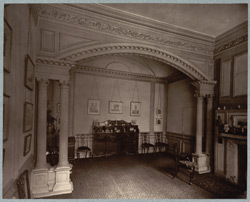 "The alcove is evidently by a later architect than Jones. This also is figured in Ware's book in an engraving (pl. 23), the only one in the book to which no architect's name is attached. The omission is certainly intentional, and Ware's practice in this matter leads me to the inference that he intended thus to indicate that the design was his own. It is thus that, in his Complete Body of Architecture, his own designs for Chesterfield House and other buildings are given anonymously."